Last week I told you about the downside of RV solar, but this week I’ll share the benefits of a solar-powered lifestyle. My RV has had solar since our maiden voyage into the full-timing life back in 2008, and we have thoroughly appreciated every minute of the sun’s awesome ability to power our lifestyle. Today I’m happy to share what I’ve come to appreciate. As I mentioned last week, RV solar cons exist, but if you read my post and you’re still considering getting your power from the sun, you’ll want to read on for the three biggest reasons why I think you’ll be happy with this substantial investment in your full-timing lifestyle. 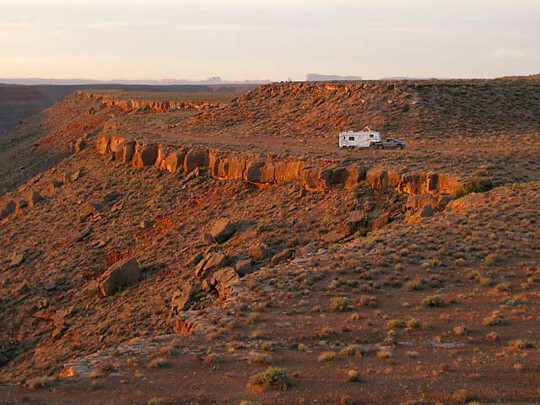 Arizona dry camping with RV solar. RV vacations are the first step toward experiencing the freedom that life on the road offers, while full-time RVing is a huge leap forward into total independence. Does life get any more freeing than that? Why, yes it does, with solar power! RV solar gives you the ability to camp anywhere you’d like, whether that means overnighting in a big box parking lot (with management’s permission, of course), or hauling your rig 20 miles into the wilderness on a bumpy dirt road. In other words, you aren’t forced to rent a campsite, you can declare it wherever you need to as long as it’s legal. Having our RV solar system means that we can pull into a parking lot after a long, hard day on the road, without needing to find a power source or run our generator (which is a big no-no in any “asphalt camping” situation). When you work online like we do, it’s critical to check in with business matters during the evening, so we’re often working well into darkness. 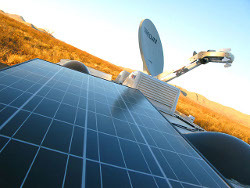 Our robust RV solar power system means we can do this anywhere we want. The old saying “it takes money to make money,” is applicable here. By investing a few thousand dollars into a system that’s powerful enough to comfortably sustain your lifestyle, you can recoup your investment in as little as one RVing season – if you commit to staying off-grid. For example, we are avid dry campers and enjoy the challenge of seeing how long we can go without paying for campsites. When we bought our current system we realized that with an average RV park nightly rent of $28, it would take 130 days of dry camping in order to pay for the investment. We need 70 more days to pay for it, which we expect to do in January. If your energy audit shows that you don’t need as much power as we do and your system costs less, it will take you even less time! As an added bonus, you’ll use less fuel in your generator, which is another substantial savings. Once RV solar is paid for, every dollar you don’t spend on rent is money in the bank. In our eight years of full-time RVing, we’ve endured power outages in a few different campgrounds, usually because of harsh weather conditions. And while our RV park neighbors started running their generators as soon as the grid went down, we hardly felt the inconvenience because all we had to do was push the “Power” button on the inverter and get back to living. Sure, we experience cloudy days that require us to rely on our Honda super quiet generator, but those days are rare. With juice from the sun, we know we can complete whatever task we are working on and then get back to the real business of full-time RVing – having fun! As you can tell, I’m a shameless promoter of going off-grid and eliminating generator noise and exhaust whenever possible. Earlier this year I wrote about it in my monthly RV Life Magazine column, On the Road for Good. Once you have power from the sun, you can go anywhere you’d like and live as inexpensively as you want. To me, this lifestyle and solar power fit together like a hand-in-glove — nothing says true freedom more than that! Yes, solar can.save money and keep you going when others have to head home. Prices will keep going down despite the precipitous drop in gas and diesel. We agree Jesus, we last way longer in Quartzsite than our friends without solar. I’m looking forward to lower solar prices so more people can enjoy it and we can have quieter camping experiences in the outback. What all does solar operate? Refrigerator, television, AC? Solar can typically help power your DC TV, stereo, charge your laptop computer, iPad and phone. With larger systems you can operate your microwave, fridge and AC with just solar. A more robust system will allow you to use all of them at the same time. Anything is possible, with plenty of panels, batteries and a large inverter. Designing your system according to your needs is critical. You can buy a small kit for under $500 or go all out and spend thousands. Better and more efficient lithium ion batteries also cost more. Wouldn’t you need a huge RV to have enough solar panels to power an AC? I live in Arizona and my rig is only a 19 footer, so I doubt that I would even have enough space on my roof to be able to power my AC, although that sounds terrific. I don’t use a microwave, but would use the fridge. Are there some AC units that are more solar-friendly than others (draw less power, etc)? Great article! Thanks Val, glad you like the article. Yes it takes a ton of roof space as well as battery storage for an appliance like that. I only know of one RVer in a 30′ motorhome with a solar system that allows him to run his A/C for about 5 minutes at a time. There may be more, especially in larger RVs, but I haven’t met any myself. And sorry I don’t know of any AC units that are more solar-friendly. Maybe someone reading does. With a planned trip to Alaska this past summer, I knew for my RV trailer (26′) I was either going to buy either a 2000 watt generator (Honda for sure) or solar. I too just hate the noise of a generator, especially the Harbor Freight $169 cheapo. ones. Started resourcing portable solar. Ended up with a Renogy 100watt suitcase unit for $279…Worked out great….Just enough to keep some lights on, run the water pump, charge Ipad and phones and keep the frig running on propane…..have 25′ of cord and a nice padded and zippered storage unit. The reason I went portable is, in the Midwest and Northeast to escape the heat of the summer, I’ll get a campsite in the shade to keep the RV cooler inside and run the portable solar panel to a sunny location. Having used it now for two seasons and maybe 60 nights, not once has the battery been low enough to prevent the frig from cycling on. To protect the circuit board on the frig, it will not light if the voltage is too low from the battery. In the past, anything over two nights I would have to plug the cord into the truck and run it for 30 minutes to bring some juice back into the battery, enough to cycle the frig again. Got to protect the ice cream in the freezer. I installed 2 panels on our motohome to provide enough power to keep 6 twelve volt batteries charged whilethe unit in storage. Gives me real peace about not abusing the batteries and having to replace them. 3 – 100watt Renogy Monocrystalline panels in parallel (Adding a 4th soon) plus tilting kits. 3000 watt Krieger power inverter. With this set up I can literally plug my unit into the inverter and run everything, not all at once of course and for a limited time only , but the system does give us a lot of flexibility. Retiring on April 3rd and will begin our full time journey after that! We have a 32′ Thor Windsport. Just wondering if you can’t keep the heat or ac on with solar panels is it worth it? 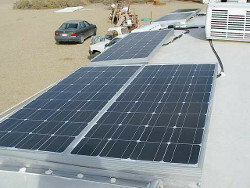 I just installed 6 each, 170 watt solar panels on the roof of my 40 foot motorcoach for dry camping. I won’t know for sure until getting down south (left Alaska and in Washington state now) to see how well it will function.